The date 4/20 has a special place in the heart—and lungs—of weed smokers all over the world. Granted, it’s not like they need a special day to light up, but 4/20 is about more than just smoking or vaping. It’s about community and camaraderie, it’s a day where marijuana users of all stripes get to hang out together. And it’s getting easier to do that now that marijuana use is becoming more mainstream, less vilified, less demonized, and, yes, even legal. Storz & Bickel: 20% off – Makers of the legendary Crafty and Mighty weed vapes. Not to mention the Volcano desktop vaporizer. Arizer: up to 35% off – The Solo 2, Air 2, and ArGo are some of the best dry herb vapes in the business, so don’t miss out on this deal. Boundless Vapes: 20% off – They make a lot of exciting vapes like the CFC 2.0 and the CFV, and they have more on the way. Get ‘em while you can. DynaVap Vapes: 20% off – If you’re into—or want to try out—analog vaporizers like the DynaVap M, then now is the best time to get one. Saionara Box Mods and Vapes: 20% off – Whether you’re a beginning or advanced concentrate vaper, you’ll find something here to like. Flowermate Vaporizers: $5 to $10 off – These weed vapes are great for newbies and pros alike. Get one for yourself or someone close to you. Premium Vaporizers: up to 30% off – You get amazing deals on industry heavyweights like the Pax 3 and DaVinci IQ, so don’t miss your chance!! When you use the coupon code 420DEAL, you get 30% off their entire product line until midnight of 4/21. So take that time to check out concentrate vapes like the innovative Plasma GQ. The Aerobee is one of the better 510 batteries available, as is the fun-to-use Squeeze Box Phantom. So, if you’re into concentrates or pre-filled cartridges, then get them while they’re cheap. Get 20% off everything on their site for the entire month of April, not just 4/20. That’s 20% off products like the Switch, with its induction heating technology. Or one of the best e-nails, the Boost. If you want to stay frugal, then you can get the Light, which is one of the better budget vape pens. You get a free fast charger when you order the Ghost MV1 premium, on-demand vaporizer. That’s $60 that you’ll be saving with each order, but you only have until the end of April to take advantage of this deal. From 4/16 until 4/22, they are giving you 40% off of everything on their site. That’s 40% off the new and improved Nova LXE. Not to mention one of the better closed system oil vaporizers, the Gio. And of course, their is the classic G Pen Elite. Get ‘em while they’re cheap! You’ve got the two days and two nights of 4/19 and 4/20 to get 20% off of the range of Linx vaporizers using coupon code LINX420. That includes the Gaia, a mid-priced vape with high-priced looks and features. It also includes the high-quality, low-budget Ember. If you want to try a concentrate straw, then the Ares is a great place to start. This CBD company is having a BOGO sale that lasts from April 18, 2019 to April 22, 2019. When you buy a product like their CBD Vape Pen at full price, you get 50% off a product of equal or lesser value. You just need to use the coupon code BOGO at the checkout and there are no restrictions on the products you can choose, so go nuts! Use the coupon code 420 to get 20% off everything on their site from now until 4/20. That includes vapes like the AirVape X, the G Pen Elite, or the Vapium Lite. These are just a small selection of the wide variety of vapes that you can choose from, so get going. You know it, you love it, the legendary Pax 3 gets a 15% discount from now until the 21st. Don’t miss out on one of the best dry herb vaporizers ever made. Use coupon code 420SALE to get 42% off anything on their website for the whole 4/20 weekend. Does that mean 42% off the Crystal? Yep. Even 42% off the Rubi? You betcha. Surely not 42% off the Amber Rose Vape Pen? Yes, even that. A deal this big doesn’t come around often so take advantage while you can. Use coupon code 420 to get a 30% discount on Rokin’s selection of concentrate vapes and 510 batteries. Like the Cyclone, the Nitro, or the Mini Tank. That’s a lot of great vapes for a such a big discount. Coupon code GWS19 gives you a discount of 20% of all their vapes. You know what that means, 20% off the Crafty, the Mighty, the Volcano, and everything else made by this company. Yeah, some other stores are giving you 4/20 discounts on Storz & Bickel products, but with this sale, you get them right from the source. DON’T MISS OUT ON THIS ONE!! But how did this marijuana holiday get started anyway? Many believe that it is the code the police use for catching someone smoking weed. Others believe that it’s a reference to the “Everybody must get stoned,” lyric from the Bob Dylan song “Rainy Day Women No. 12 & 35,” since 12 x 35 = 420. However, those theories have long been debunked. So, what’s the real origin of 4/20? It started with a group of California teens called the Waldos, so named because they liked to hang out by the wall outside their school in San Rafael. In 1971, the Waldos went on a treasure hunt for green gold, yes that sounds like the plot of an ‘80’s movie, but it actually happened. They heard about a member of the Coast Guard who had planted a marijuana plant but was unable to take care of it. The teens managed to procure a map leading to the mystery marijuana and would meet at least once a week, after school, by the Louis Pasteur statue, to go on a jaunt to find the cannabis. And what was their meeting time? You guessed it: 4:20 PM. Unfortunately, they never found the mystery weed, but the 420 code number did give them a way to talk openly about pot in front of parents and teachers without their suspecting anything. So, how did this private code-word enter the international lexicon? You can thank the Grateful Dead for that. Many of the Waldos had access to the band because their parents worked with the band in one capacity or another. They would use their code around the band members, who eventually caught on. 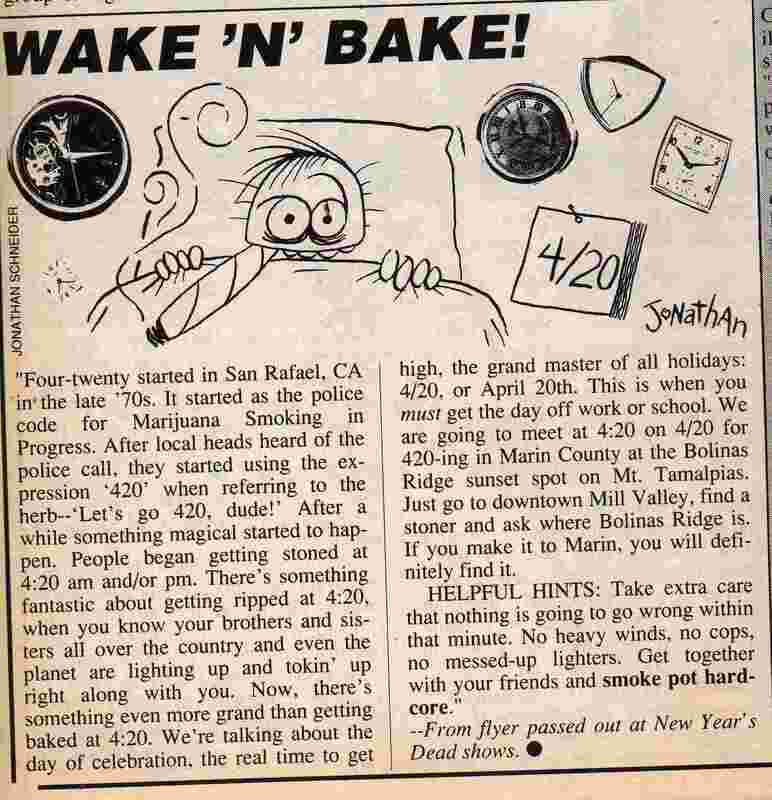 The term started to spread throughout the local stoner community until a reporter for the High Times came along in 1990. He was covering a Grateful Dead concert and a Deadhead handed him a flyer that detailed the origins of 420 and stated, among other things, “We are going to meet at 4:20 on 4/20 for 420-ing…” Once High Times—the Time magazine for stoners—learned of the term, they got it out to the world, and the rest is history. That’s why we celebrate 4/20 and that’s why you get all these awesome deals on the big day. 4/20 is a day for partying and celebration, but don’t miss out on these great deals either. They can make the day even better, not to mention all the other days in the year. So after you grab your weed, bowl, bong, vaporizer, dab rig, or what-have-you, don’t forget to grab your phone, tablet, laptop, etc. to take advantage of all the great 4/20 deals available. The One is a mid-priced dry herb vaporizer that delivers top tier performance in a sleek, stylish package. The Arizer Air 2 is a low-maintenance weed vaporizer that delivers excellent vapor and is very easy to use for experts and beginners.